Having chastised his audience for responding to the trials of life according to the wisdom of this fallen world, James exhorts his audience in the final verses of his epistle to use their tongues in a manner congruent with heavenly wisdom. This shows us that we can gain assurance that we possess this merciful wisdom from above when we use our tongues properly (3:17). One good use of the tongue is in prayer. With the prayer of faith, God grants us heavenly wisdom (1:5–7). However, not only does prayer grant us wisdom, we will also see in today’s passage that it demonstrates that such wisdom is already present. We saw in chapter 3 that when we use our tongues to bless and encourage others, we reflect the pure and gentle wisdom from above (vv. 1–18). In 5:16, James picks up this theme again in exhorting us to confess our sins to others and to pray for one another in order that we might be healed. By exhorting others to stand firm in the midst of temptation and offering prayer on their behalf, we bless other people and thus live according to the wisdom of God (3:9–10; 17–18). That there was much sin in James’ original audience is clear from other parts of his letter. Quarreling and other forms of strife rooted in the sins of selfishness and coveting made it necessary for James to issue his call for repentance (4:1–10). This sin, it seems, had even led to physical illness (5:15). Though there is not always an exact correspondence between our sins and sicknesses (John 9:1–3), sickness is indeed sometimes the result of our evil acts (1 Cor. 11:27–30). Therefore, it is appropriate when praying for healing to consider and confess any sin that we think might be related to our difficulty. Moreover, while prayer is part of the elder’s responsibilities, today’s passage makes it clear that the wise use of the tongue in prayer, confession, and encouragement is to be the work of the entire church. But today’s passage not only calls all of us to pray, it also tells us that the prayer of righteous people has great power (5:16). As we live holy lives, we should expect that God will do mighty things with our prayers just as He did with the prayers of Elijah (vv. 17–18). In 4:4, James warns us against seeking friendship with the world partly because friendship with the world produces ineffectual prayer (vv. 1–3). Instead, we must be friends of God. 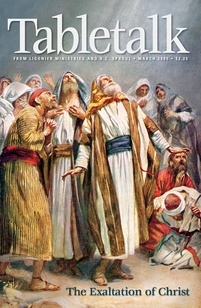 Elijah was such a friend of God that he was translated into heaven instead of having to suffer death (2 Kings 2:1–12a). Like Elijah, when we are friends of God, He will use our prayer to do mighty things. As a friend of God, spend time in study and in prayer.